KUT's O’Dark 30 is now in semi-prime time with more of the very best from the world of independent radio production. Sunday nights at 10 on Austin's KUT 90.5 we present 3 hours of a wee bit of everything from the world of independent radio production. These are public radio stories made over many years, by producer Jay Allison -- working together with Christina Egloff, and friends, colleagues, neighbors, strangers and whoever would take the loan of one of his tape recorders. They are are stories about life as we find it, and record it. HOST: Alex Chadwick In this hour: Beginnings	(9:45) A chorus of artists recalling the moment they began. Jack Murdurian Sings	(6:00) The sound of art and memory fused on an audio cassette. How many songs can he sing in 45 minues without stopping? Produced with David Greenberger. Jungles of Memory	(23:15) A story of war and sanctuary, of beasts and obsession, the story of James McMullen and the Florida Panther. Lead Producer, Christina Egloff. Cypress Knees	(12:55) The 70-year-old King of the cypress swamp has trouble remembering exactly where he is, even as he scampers barefoot along a single board catwalk suspended above the slough. Ghosts	(4:00) Even though she's not sure there are, writer Carol Wasserman hopes there are ghosts next door. Produced with Viki Merrick. In this short segment Rabbi Neil Blumofe highlights the significance of Mile Davis' album Kind of Blue. The 1950s were a time of great uncertainty in America. The Cold War, segregation and homophobia added to social fears and neurosis. When Kind of Blue was released in August of 1959 it was received as a collective deep breath among a generation on edge. In this feature rabbi Neil Blumofe highlights the significance of this album at it's time, and offers a spiritual perspective on what it means to us even today. 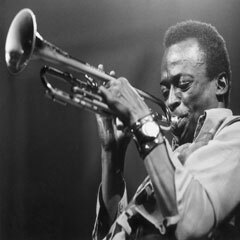 Check out KUT's Views and Brews on Miles Davis and The Making of Kind of Blue recorded live at the Cactus Cafe in Austin, Texas. When Re:sound host, Gwen Macsai was fourteen, the incredible female race-horse, Ruffian, ran straight into her heart and left a permanent impression. It’s June 1973 and Secretariat has just become the first horse in 25 years to win the triple crown, obliterating his competition in the Belmont stakes by 31 lengths and setting a new world record. Interest in horseracing is soaring. Women’s Lib is in full swing. Ms. Magazine is just one year old. The Equal Rights Ammendment has been ratified in 30 states but is still a very contentious issue. And in September of ’73, a loud-mouth former tennis champion named Bobby Riggs becomes the male chauvinist pig that everyone loved to hate. This was the climate in which a beautiful female race-horse named Ruffian captured the attention of the country, and stole Gwen Macsai's fourteen-year-old heart. In this personal essay, Gwen recounts Ruffian's racing career, including her tragic battle-the-sexes race that ended in heartbreak. A beautiful story of adoption from rural East Cork - two children from Guatemala, an English mother and an Italian father. This documentary tells the story of the adoption of two children from Guatemala by a couple in County Cork. Los Preciosos means 'the precious ones,' and this documentary follows the story of years of assessment by domestic social workers, monumental bureaucracy in Ireland, England and Guatemala, and eventually traveling to bring the child home. And then there is another child . . . There is a twist in the tale of this story of a family of many nationalities - an English mother, an Italian father, two Guatemalan children, all living in rural East Cork. It tells the emotional and practical journey of making an adoptive family. It used to be people would say "Oh, the 1940s and 50s, that was the Golden Age of radio." Maybe ten years ago they were right. Now, I'd say the 2010s are Golden Age of Radio. Take radio itself then add on satellite radio, HD radio, the internet, podcasts, mobile devices... the deluge of audio content is ridiculous. And, I didn't even mention audio tours, the topic on this edition of HowSound. Radio producer Pejk Malinovski has ventured into the world of producing audio tours. He thinks other radio producers should, too, if for no other reason than they both use the same tools and skill set. Pejk's first audio tour production was Passing Stranger: The East Village Poetry Walk . On HowSound, Pejk talks about the tour and some of the differences between producing for radio and producing for a tour. You should be sure to visit the Passing Stranger site AFTER you listen to the podcast. It's fascinating to see how they repurposed the audio tour for the web. Insanely clever, I'd say. So a guy walks into a bar and... nothing happens. Chatterbox presents an original comedy about thunderstorms, dictionaries, and the expectations of entertainment. I wish very much that Roman à Clef was itself a roman à clef, but no such luck. It would more appropriately be described as an allegory, a farce -- or maybe just one really long, goofy joke. Conceived during a fit of frustration with television (and all forms of mindless entertainment), Roman à Clef was originally written as a stage play. But after finishing I realized that, given the static setting and the stationary characters, it would make for a fairly dull stage play, at least visually. Adapting it for audio, however, made perfect sense. Silly as it is, the show attempts to touch on some serious topics, and I hope that attempt comes through; I hope that, unlike the boys at the bar, you will reach the end of the play with some notion of larger issues. If nothing else, the next time you’re sprawled out in front of the TV, I hope you’ll at least ask yourself: "Why the hell am I watching this?" William Pope.L, an American performance artist and interventionist, talks about Blink, his magic lantern show for Prospect.2 New Orleans, 2011. William Pope.L, a performance artist and interventionist based in Chicago and Lewiston, Maine, is presenting a magic lantern show titled Blink for Prospect.2 New Orleans, the 2011 U.S. Biennial. For his project, the artist made a film from more than a thousand images donated by the people of New Orleans. 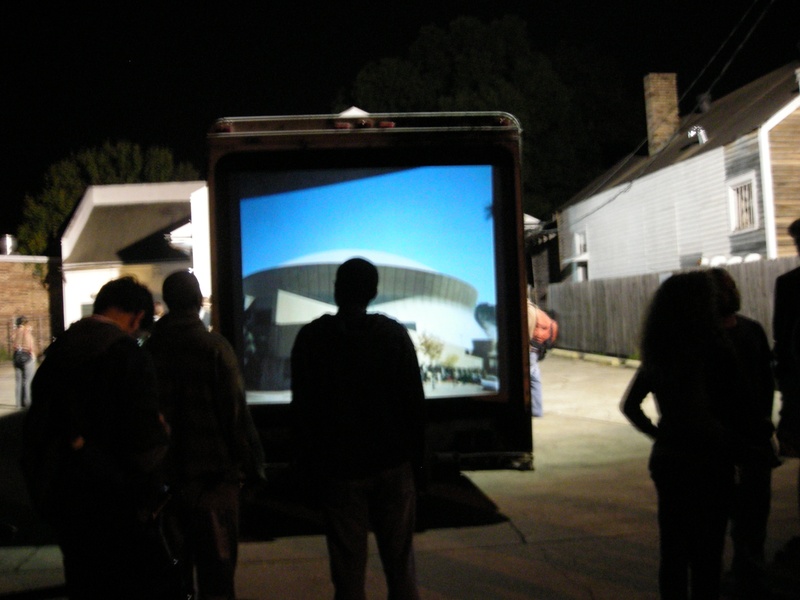 On the night of October 22, he projected the film through the back of an old ice cream truck as it was pulled through the streets of the city by volunteers. Blink came to rest at Xavier University where it will remain on view through January 2012. This Fresh Talk episode features a conversation with Pope.L, the sounds of Blink in motion and a hint of Don Quixote.